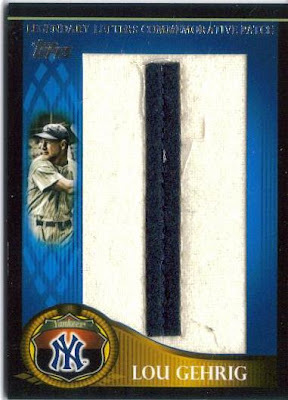 Amid all of the happenings this weekend, this awesome card was waiting for me when I got in on Friday... That leaves Hank Bauer as the biggest name left for my 1955 set, and 25 cards left to finish this set out... oh man, is it getting close!!! Yesterday, Max (http://maxscards.blogspot.com/), Pete (http://dropped3rdstrike.blogspot.com/) and I busted a case of Series II Topps at the card shop. I opened 3 of the jumbo boxes, Pete got 2 and Max got one. I'm sure each of them will be blogging on their finds shortly, but as far as what I ended up with, here is a breakdown of what I WENT HOME with (I traded out/for a few things to Max and Pete, so they will probably talk about them on their blogs). Once again, I had a blast opening these boxes with my friends. I think I can speak for everyone there and say that a good time was had by all. This set will definitely go down for me as one of the most enjoyable that I have put together, not only because of the quality of cards, but the quality of people that were involved in the process of me working out this deal. For me to be able to sit around and bust wax with people who I can truly call my friends, well, this was a gratifying experience. I want to thank Pete, P.A. and Max for taking or maintaining an interest in something that interests me. 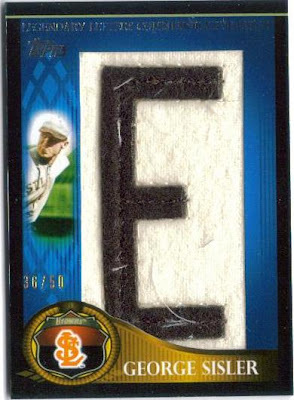 I hope you guys can all go on this ride with me again soon when Allen and Ginter comes out! 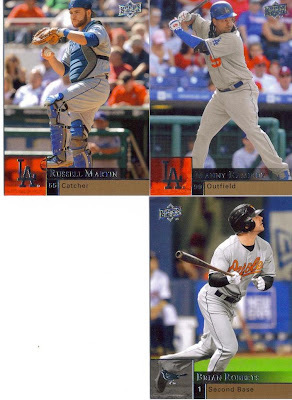 A by the numbers blog will follow, but I have completed my 2009 Topps set. This is by far, one of my favorite sets that I have ever completed. Along with the great photography that was featured this year, it will have sentimantal value as well because it has brought me together with a special group of friends in putting this together. P.A., Pete, Kim and Max, its been a blast working together getting this set put together. I will have more on this later as well!! Since I had all the cards for this set in the 6 total Jumbo boxes of Series I and Series II, I get to pick the completer card... 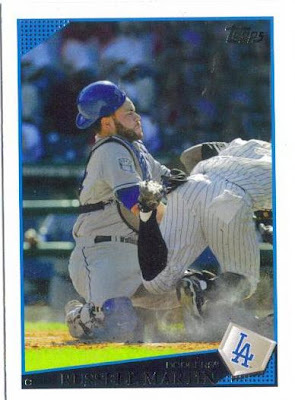 I chose Russell Martin because I think it symbolizes the group effort that this set became. WILL BE IN BALTIMORE ON FRIDAY!!!!!!!!!!!!!!!!!!!!!!!! Adam Jones is for real. 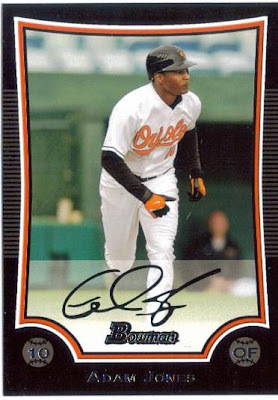 I honestly believe he will be the Orioles representative to the All Star game. You could make a case for Brian Roberts, and Nick the Stick as well, but really, you and I know that Dustin Pedroia could bat below the Mendoza line and still get an overwhelming majority of the votes at second base (same with Robinson Cano) when players like Ian Kinsler and Brian Roberts are clamoring for a backup spot. We all know baseball doesn't exist outside of New York and Boston. Uggh. Adam Jones and Nick Markakis are deserving of starting spots on the team, so far, but seeing as Nick always gets slighted when it comes time for the gold gloves to be awarded, I doubt either will get starting nods. It will be the usual suspects, I'm sure. Ichiro definitely will get voted in, and I have no problem with that, he is AWESOME. Jason Bay will get another starting nod as well. I bet Torii Hunter will be the other. Not bad choices, but man, Jones is TEARING it up! I hope he keeps it up, the O's are every bit as terrible as I thought they would be, but man, they sure are fun to watch, unlike past years. Of course, he pulled the card. He will put it on ebay, I'm sure. 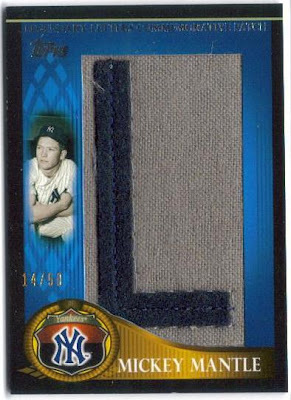 Sad thing is, it quite possibly was the pack that Kim put back in the box... AND, Pete was seconds away from asking Jeremy if he wantedto split the box... OUCH Kim and Pete... Oh well, we'll get to bust our Topps Series II boxes this weekend... Yes, the suspense is KILLING me. When I got into town today, I had a good few cards waiting for me, including these two beauties. I am speechless. Very nice, I especially love the green, I like how it stands out!! Barring Al Gore requesting a recount of the whopping 11 votes i got, it appears that we have a TIE...? 1959 and 1969 with 4 votes each. Well, as the blogmaster, I propose this solution. 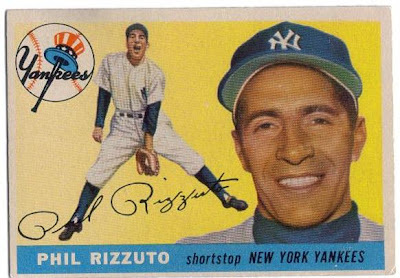 I will begin 1959 when I complete my 1955 set and I will begin 1969 when I complete my 1970 set. Sounds fair enough to me. 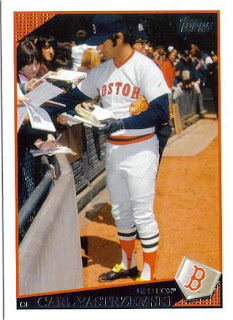 I will hold off on 1971 and 1972 (my 71s are all pretty much poor-fair condition anyway and I doubt I have enough 72's to really get moving, with the exception that I already have the 72 Rose and the 72 Carlton Fisk RC). So, with my 1955 set coming to a close soon, I was wondering which set I will try to complete next. I decided that I would allow my blog readers (all 2 of them, lol) to help me in deciding which year to build by adding a poll to the blog. I'll pause while you admire the poll on the side... still pausing... ok. I have a good bit of loose cards of the 5 years I posted. I would be very interested in each, so, what do you guys think?? The poll closes at 6 something on 5/20/09. Vote away! Also, leave me some comments. Picked this up today at my first day back at the shop in a while (raising money so i can afford Series II). 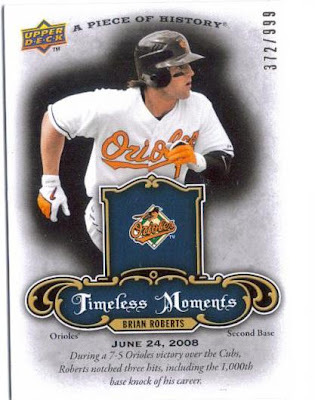 Just a really nice looking card, Piece of History Timeless Moments Brian Roberts. I wasn't too sold on the Piece of History set this year. 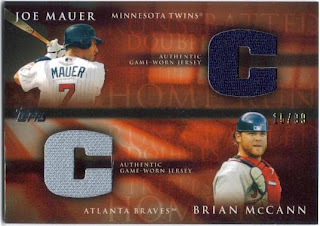 but pulling this card may have sold me on it... What do you guys think? Pretty nice, huh? Took Christopher to Trademark Sportscards in Harrisburg, NC today because I was bored. Spent a little more money than I wanted, but I was able to knock out 3 1955's and 61 1970's. As it stands, I need 25 to go for my 1955 set and 185 to go for my 1970 set... I also drove by Z-Max dragway in Concord for the first time... that place is impressive! 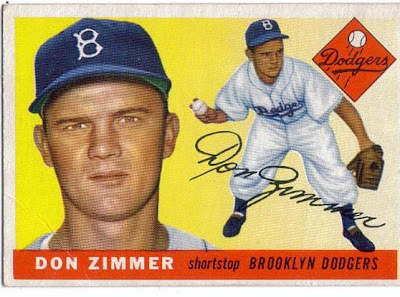 Anyway, I got the Don Zimmer RC for my 1955 set. Not too bad. Got a friend looking for trading partners... email him. Got this email the other day from one of my regulars from the card shop. He is looking for trading partners, so if you're interested, his email is at the bottom. 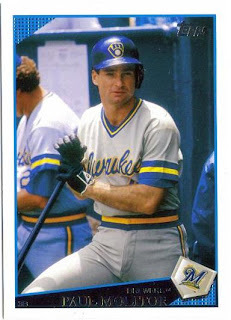 I am actively seeking new trading partners for vintage (primarily late 1960's-early 80's) baseball cards. I have many early to mid 70's cards as well as some late 70's, early to late 80's as well as some 90's (Griffey, Bonds, Maddux, Glavine, etc) to trade for same types of cards. 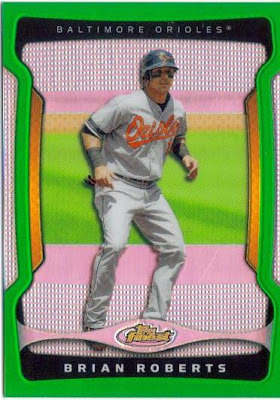 My primary interest are early to mid 70's cards with a focus right now on building Hostess, Post, and Kelloggs Cereal sets. 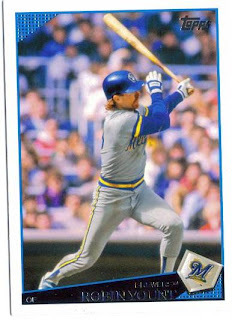 I am also building a fairly high grade 1976 Topps set as well as a high grade 1979/1980 set. I have approx 600 1978 Topps that grade out at VG+/EXMT and a few 74 & 77 Topps and I would be willing to trade THREE FOR ONE if you have high grade 76's, 79 or 80. I would also be willing to trade for Mothers Cookies, Jello Cards, odd sets, etc. Main interest is in Hall of Fame players of 70's and 80's......and of course "the man" Pete Rose! If you would be remotely interest in doing some trading, please provide a list of what you are wanting, willing to trade......and LET'S TALK TRADING TURKEY! !